Halloumi gets ooey and runny when heated, while still holding its shape and without separating like some cheeses would. It’s not like I need a recipe for it when it’s perfection simply brushed with oil and heated in a pan. (Aaaand, as it turns out, I already have several recipes and ideas for halloumi to begin with.) But I’ve never paired it with something as strong as rosemary or as sweet as grilled grapes, so I found this recipe intriguing. 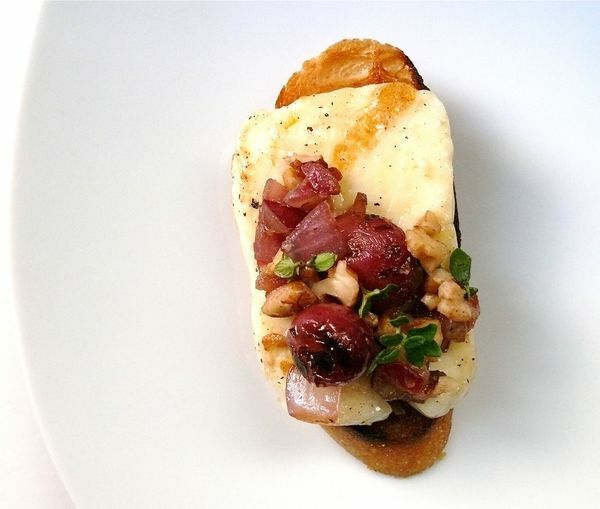 It’s a great balance of flavours and salty halloumi still gets to be the star, with walnuts and grilled bread adding texture and making it a meal. It’s something that’s ideal for summer when you’re likely standing over a barbeque weekly, but I found it works perfectly well using a grill pan on your stovetop too. YS Note: *While this recipe instructs you to use an outdoor grill, you can easily make this on the stove using a seasoned or well-oiled grill pan or even a non-stick skillet. You can take all kinds of other liberties with this recipe too, like I did, opting for thyme over rosemary and using baguette slices. Drizzle the onion slices with 2 tsp. of the oil and lightly season them with salt and pepper. Pat the cheese dry and drizzle with 2 tsp. of the oil. In a small bowl, mix the remaining 2 Tbs. of oil, the garlic, and a pinch each of salt and pepper; brush the mixture evenly over one side of the bread slices. Meanwhile, toast the walnuts in a small skillet over medium heat, stirring frequently, until golden-brown, 4 to 5 minutes. 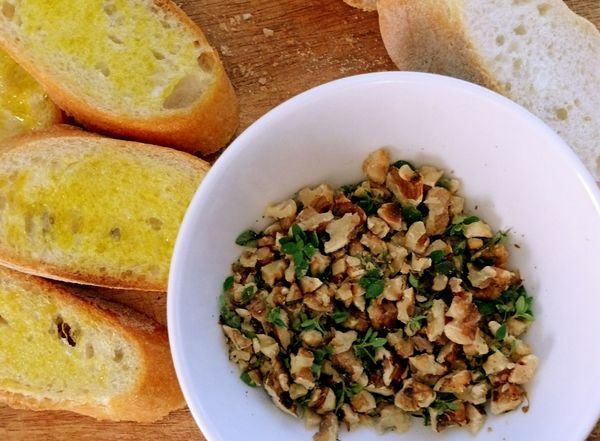 Coarsely chop the walnuts while still hot and transfer them to a medium bowl. Mix in the rosemary. 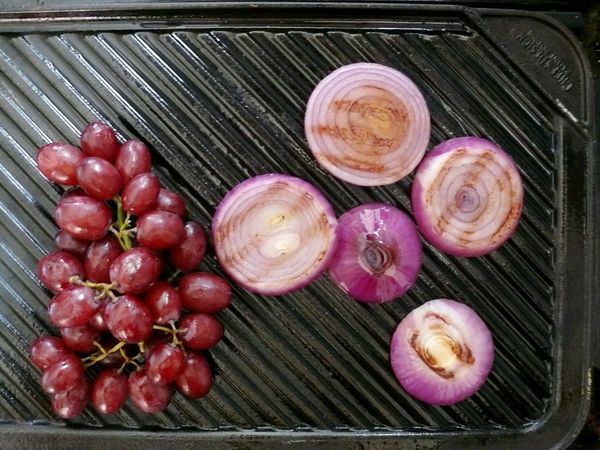 Put the onion slices and bunch of grapes on the grill grate. Cover and grill, turning once, until the grapes are bursting and the onions are grill marked, about 10 minutes. Transfer the grapes to the bowl with the walnuts, and the onions to a cutting board. Use tongs to simultaneously pull the grapes from their stems and crush them, dropping them into the bowl. Chop the grilled onions and add them to the bowl. Season to taste with the vinegar, salt, and pepper. Clean and oil the grill grate. Put the bread and cheese on the grate and grill uncovered, turning once, until marked on both sides, 4 to 5 minutes (about 1 minute if using provolone).